Let our designers transform your venue to create the wedding of your dreams. Our balloon decor is an amazing art form. Designed and tailor made to suit both your venue and your budget we use only the highest quality balloons that are available in an array of beautiful colours to coordinate with your flowers, dresses or cake. 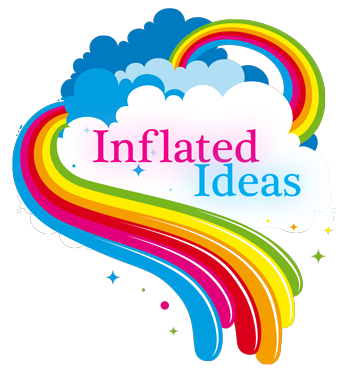 Inflated ideas can also offer you a specialist colour matching service where both balloons and bows can be designed to match any colour scheme and are perfect for decorating the church, home, cars and venue. We pride ourselves on our ability to design and create the decor you dream of. Bouquets: clusters of beautiful balloons presented on colour coordinating ribbons which can be anchored to a variety of weights. Centrepieces: beautifully designed themed centrepieces can be made to any specification, using our design skills and artistic flair we will produce a work of art for your tables. Sculptures: for a really amazing effect why not choose to incorporate a stunning heart sculpture, a walk through arch or our simple but stunning colmns topped with a heart or star foil . For a softer effect we use speciality lights inside our balloons to create a truly romantic feel. Or let us create the perfect couple shown here to greet your guests at your venue, designs can be tailor made to your exact specifications. Why not browse through our gallery and discover more of the designs Inflated ideas have created, then let us work our design magic on your special day.